It’s been nearly a week since Florida gubernatorial hopefuls Ron DeSantis and Andrew Gillum squared off in their final debate before Election Day. In the most contentious debate I’ve witnessed in my lifetime, Gillum made it abundantly clear that anytime he was criticized about his policies or his record as Mayor of Tallahassee, he was going to label DeSantis a racist. The strategy was simple: keep voters mad at DeDantis by making him into a boogie man, so they don’t bother to examine Gillum’s job as mayor for themselves. After the smoke of the heated debate had cleared, three things stood out about the democratic socialist, Andrew Gillum: 1) he’s a race-baiter, 2) he’s corrupt, and, 3) his policies would be damaging and regressive to Florida’s diverse and thriving economy. Growing up in Los Angeles, California, I never experienced the true ethnic diversity like you see in the state of Florida. Sure, there were different races and ethnicities represented there, but many of us remained segregated in our own communities, often times, voluntarily. So, you can imagine my shock when I moved to Orlando, Fl (the south by all intents and purposes) in 1993 and saw that people of all races and ethnicities lived in the same neighborhoods and mingled amongst each other. I was particularly shocked at how many interracial couples I’d see walking around town. That was rare in California at the time. To be clear, I’m not stating that there weren’t issues of racism here, there were. But, Florida, as I saw it, exemplified our nation’s motto, E Pluribus Unum – from many one. Although many races and ethnicities live here, multiculturalism isn’t a huge issue. We have many racial and ethnic differences. Many hold on to the customs of their native lands, but we’re all American first, a true melting pot. So, you can imagine my frustration watching the gubernatorial debates as it became clear that Andrew Gillum’s response to virtually all of DeSantis’s criticisms of him was to call him a racist. He never hesitated to play the race card. In just a couple of debates, Gillum has managed to pit blacks against whites, the rich against the poor and men against women. If he’s elected, it’ll be virtually impossible for Republicans to criticize his policies without being branded racists. This is exactly what the left wants. Why? Because they don’t want to be judge by the validity of their failing policies. Secondly, we now have records that show Andrew Gillum illegally accepted bribes as the mayor of Tallahassee and he flat out lied about it to our faces in both debates! That should scare all of us enough to stop him from becoming governor. 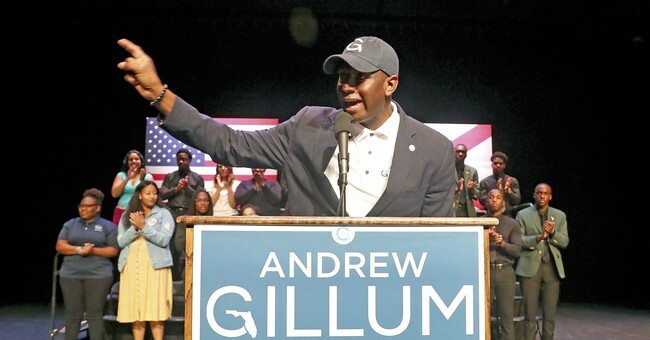 Many voters are finding out for the first time that Gillum accepted trips to New York City and Costa Rica, tickets to Hamilton the play, and paid for hotel stays from an FBI undercover agent, by the name of Mike Miller. In exchange, Gillum hooked him up with $2 million in government contracts. But, it didn’t stop there! In one of their latest headlines about Gillum, The Tampa Bay Times reported that “New Andrew Gillum Documents Show FBI Agent Might have Paid for Fundraiser Dinner.” The column goes on to say “An FBI agent might have paid more than $4,000 in food and drinks for one of Andrew Gillum’s campaign fundraisers in 2016…” Furthermore, the Tampa Bay Times explains “But the contribution in early 2016 does not appear in the records for Gillum’s political committee.” Approximately 40 people that attended the event were served “filet mignons, salmon mousse canapes and cocktails, provided by 101 Restaurant.” Adam Corey, a Tallahassee lobbyist, friend to Gillum, and former owner of the restaurant passed the bill off to undercover agent Mike Miller, presumedly so Gillum didn’t get his hands dirty? The questions that need to be asked of Gillum by all Floridians are 1) How can we trust a man that takes bribes to handle Florida’s large budget without corruption? And, 2) Does he expect to continue living like a king as governor? Lastly, Andrew Gillum’s “healthcare for all,” free college tuition for all, raise Florida’s corporate tax rate by nearly 40%, from 5.5% to nearly 8 percent, would devastate our economy. We’ve been lied to before about healthcare for all by another smooth-tongued leftists by the name of President Barack Obama that had a larger budget at his disposal. He claimed that “if you like your healthcare plan, you’ll be able to keep your health care plan, period.” After 4.7 million cancelations of existing plans by health insurance companies in 32 states, due to new benefit mandates, such as men having to buy birth control insurance, it became apparent Obama lied. He also lied about being able to keep your doctors. Many plans under the Obamacare exchanges offered limited provider networks, which ensured that most wouldn’t be able to keep their existing doctor, or they’d have to pay more to do so. This included Medicare patients. Not to mention Obama’s most infamous lie of all, “In an Obama administration, we’ll lower premiums by up to $2,500 for a typical family per year.” Instead, monthly premiums for families increased by more than 100 percent, an average of $2,976 in the first few years of Obamacares implementation and they’re still rising today. Andrew Gillum is selling fairytales that Floridians will have to pay for. By using the race-card and stoking envy and fear amongst voters by demonizing job creators and claiming DeSantis’s policies will hurt Floridians because he doesn’t care about the poor and elderly, when we know that to be true given eight years of Rick Scott’s successful governorship, it’s clear that Gillum will say or do anything to gain power. Don’t let Gillum’s good looks, nice smile and smooth-tongue fool you. He never had any intention on debating the merits of his policies because they’ve already been tried and failed.